We offer a wide range of specialized industrial grade all-in-one multi-touch panel PCs and HMIs that find their applications such as Internet of Things (IoT), M2M, HMI, SCADA, or MES applications. Our range of panel pcs include: Android, Windows or Linux OS based systems with wide range of display sizes from 7" to 22" or larger. Our rugged water and dust proof line of industrial panel PCs are designed for outdoor and factory environments. These units can be customized to support specialized high brightness sunlight readable screens and designed to operate under wide temperature ranges. We also offer variety of mounting options including open-frame models that can be easily integrated and embedded in kiosks and other media consoles. We also customize these units including building special enclosures for kiosks and gaming systems. The above unit was custom developed for out-door Intercomm application. The display incorporates a 1000 nits sunlight readable screen, a stereo speaker system and a microphone. The panel PC is embeddable in a wall or a cabinet. The OS is Android 6.1. A key feature of the unit is the support for built-in PoE (802.3af/at). Designed for outdoors, the unit is front IP65 with a capacitive touchscreen. 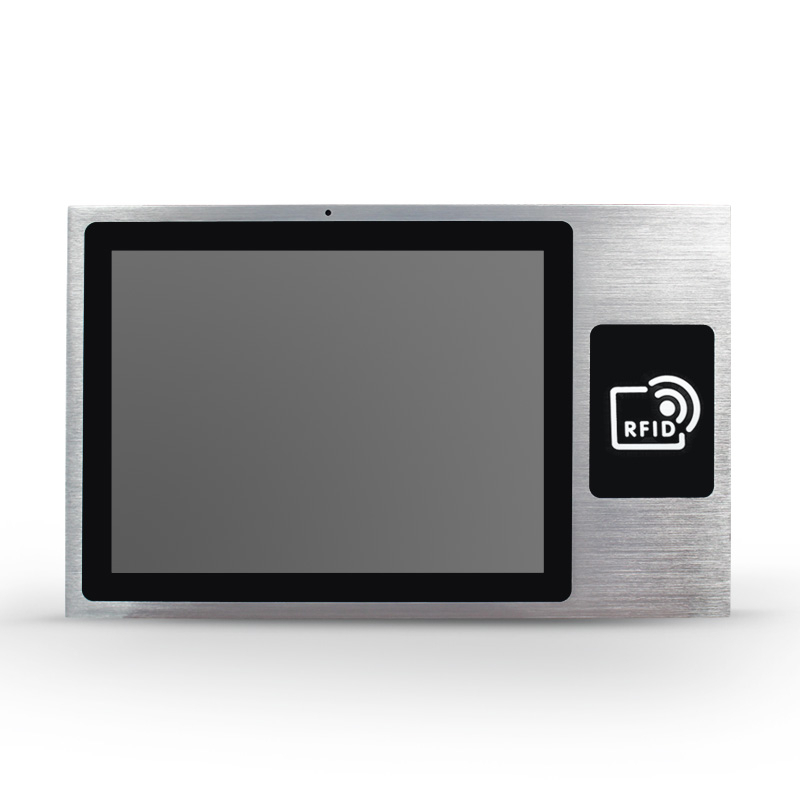 This 10.1" unit was custom built with an IP65 front high resolution touchscreen and a consipous area for RFID/NFC reader. This was designed for access control and employee time data entry where users can easily tap their ID on the area and register. Please contact us to inqure about our services and we are happy to work with you in developing a solution that will meet your specific requirements.